Gold is neither the rarest nor the most valuable metal, yet it has served as the foundation of trade and commerce for centuries. All great civilizations built up treasuries of the lustrous metal, reserving golden objects for their most important rituals. 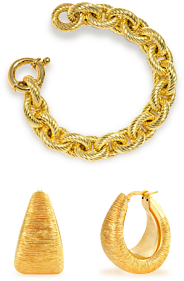 Gold in its purest state is referred to as 24-karat gold, and is generally considered too soft for practical use in jewelry. Normally, it is alloyed or combined with other metals for increased strength and workability, a practice that is thousands of years old. Most American gold jewelry is 14k or marked 585, which means it is made of 14 parts gold combined or alloyed with 10 parts of other metals to add strength and color. This means that 14karat gold is actually 58.5% pure gold. 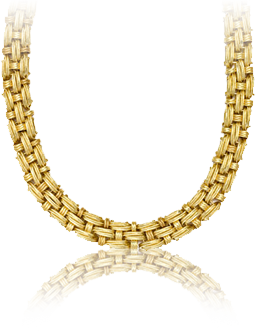 Eighteen karat gold, 18k or marked 750, Is 18 parts gold and 6 parts other metals and is 75% pure gold. And 10k or 416, is just 41% pure gold. Nothing less than 10k gold can legally be sold as gold jewelry in the United States. The alloys not only provide hardness and durability, but also create color variations in gold, depending on the type of alloy metals added. For example; nickel, silver and zinc are added to create white gold, while the addition of copper produces pink or rose gold, and yellow gold is alloyed with equal parts of silver and copper. Gold is the only material known to man that contains in combination the four characteristics of lustrous beauty, virtual indestructibility, extreme rarity, and ease of workability. Being the most malleable of all metals, a single ounce of gold could be stretched into a wire 60 miles long. It can be worked into a leaf of 6sq.ft. a thickness of .0000033 inches. In fact, the next time you look at a picture of our astronauts on the moon, you'll notice that they are looking through a thin sheet of gold in their face shields. Gold is and always has been recycled. Pure gold is indestructible, it will not corrode, rust or tarnish and cannot be destroyed by fire. All the gold taken from the earth during all of recorded history is still being melted and re-melted and used again and again. The gold you own and wear today may once have adorned King Solomon's Temple, perhaps been worn by Cleopatra or have been carried to Bethlehem by three wise men. I hope you have enjoyed reading this as much as I have enjoyed putting this together for you.